I am going to share a cool secret I just discovered. It’s a real game changer . 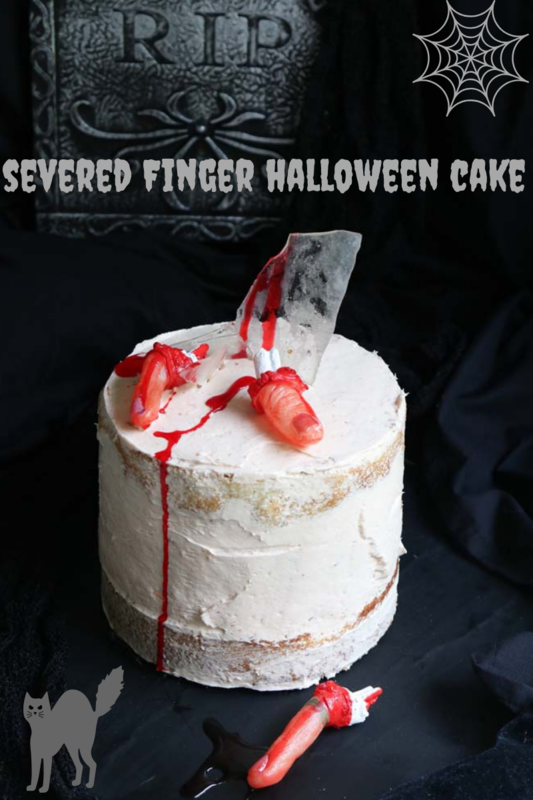 It’s the Secret to Intense buttercream AND a cool Halloween severed Finger Cake!…..
Yep this cake is complete fun BUT it is the secret the buttercream is holding that is the whole reason for this post. I am going to reveal the secret to intense buttercream, a flavour that only improves. This one is intensely Strawberry flavoured buttercream and it is the BEST. It’s made with the simplest of things you could ever imagine…..a packet of jelly crystals. This idea is going to change your frostings forever ! No matter what cake flavour you want, use this trick to ensure everyone will be asking how you did it. The very interesting thing about this cake is the discovery of how I could make intensely strawberry flavoured buttercream without spending a fortune on freeze dried strawberry powder. This little trick worked when I made these Strawberry Meringue Ice Cream Sandwiches, so I thought it may work with buttercream. I pre-tested the theory out by adding some mango crystals to cold cream and leaving it overnight. By morning I had an intensely mango tasting cream. Normal texture just totally intense in flavour the longer it sits. I went ahead and added a packet of jelly crystals to my ordinary buttercream. This is genius. It adds buckets of flavour but very little colour and no texture change. 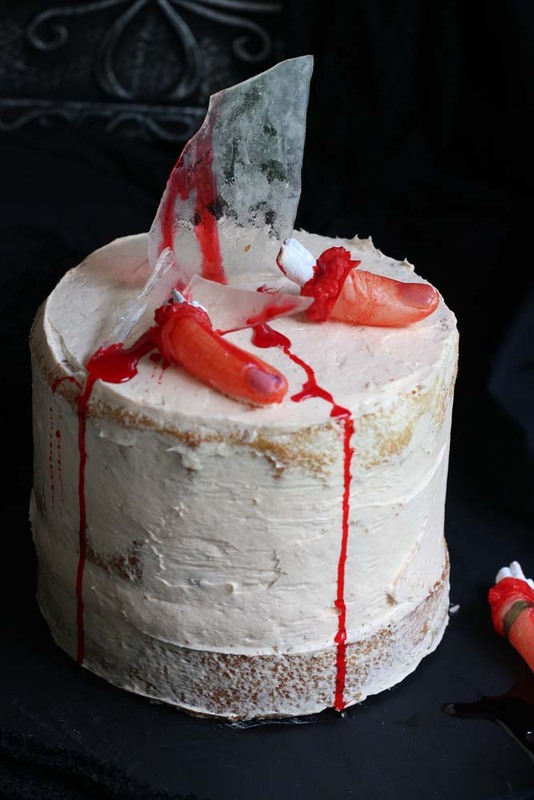 This is a pretty easy Halloween cake. It’s a basic 3 tire vanilla number with buttercream frosting. 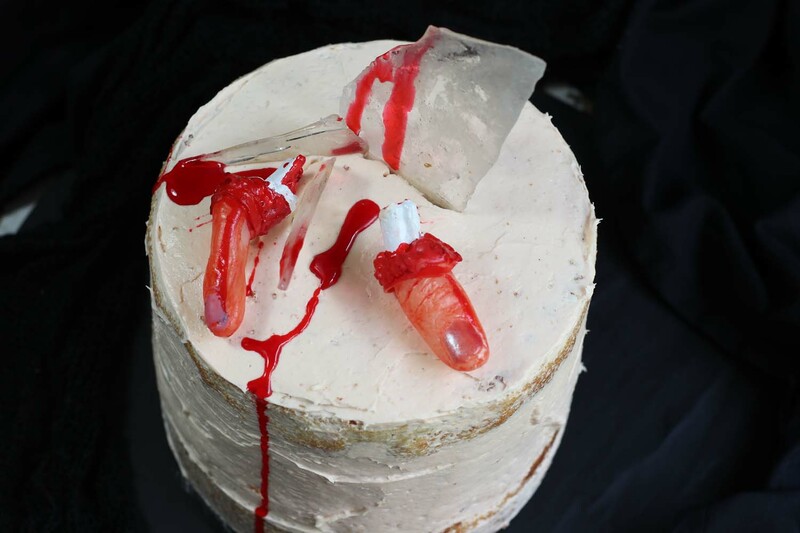 The severed fingers are from the Halloween shop. 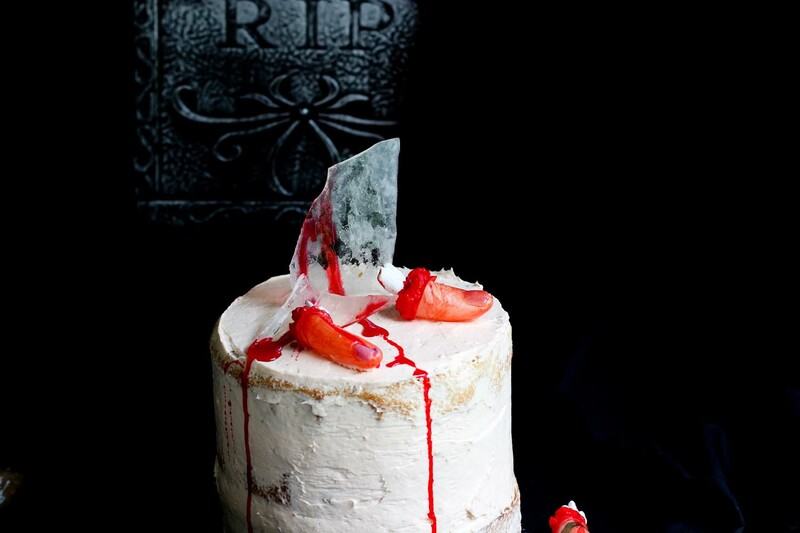 The shards of glass are made of Isomalt sugar. This is a sugar you melt and pour onto a tray or colour or shape and it doesn’t melt like plain praline sugar. Its up to you, you can, replace it with plain praline sugar shards if you can’t get your hands on Isomalt sugar. Its not hard to prepare the Isomalt but it is a liquid that is as hot as lava and by god you need to be careful with it. You can also use a few smashed boiled lollies to look like glass too, if you just don’t want to play with liquid sugar. There’s delicious blood made from golden syrup..teehhee… It looked gruesome enough to turn a few peoples stomachs. All I have left to say is this. Watch to see how this intensely flavoured buttercream is made and check out my easy decorating lesson. 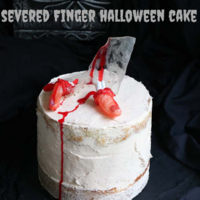 Use any cake recipe you like and coat it in buttercream or use this white cake recipe HERE or HERE or you can make it with a gluten free white cake recipe. That’s coming up next post. Here’s the recipe for the game changing flavour bomb buttercream and some directions on how to melt Isomalt sugar if you are keen. Follow the recipe for a white cake above You will find the Strawberry Buttercream below and instructions to use Isomalt sugar. You will need a candy thermometer for this one. Beat the butter and cream cheese till light and creamy. Continue beating and add icing sugar in three lots. Beating well between additions. Add the lemon juice and combine well. The buttercream is now ready to use. This amount will cover a three tire 20- 24 cm cake. Mix the syrup and colour together and set aside till needed. How to use Isomalt sugar. Fill a bowl with a bit of cold water. This is to cool the bottom of the pot. Prepare a large tray and cover with baking paper. Put 1/2 the Isomalt into a pot. Put the pot onto a medium heat til the sugar melts, you can stir in all the loose pieces so they melt together, then add the next 1/2. Stir carefully till the new dry bits have started to incorporate. Add the thermometer and continue cooking. The sugar will start to look like a clear bubbling liquid. Bring the sugar up to 195 C and then turn off the heat. Pour the sugar onto the lined tray. Once set the Isomalt can be put into a storage container and kept for some time. Use some of this sugar as pieces of glass. They will not melt even in the refrigerator. You can always use praline too but this will melt quickly. Find the recipe for Praline here. If you want to colour the sugar do so when it is done. use gel colours rather than liquid colours.